According to this one author, it’s in a skillet, over medium heat. With butter. 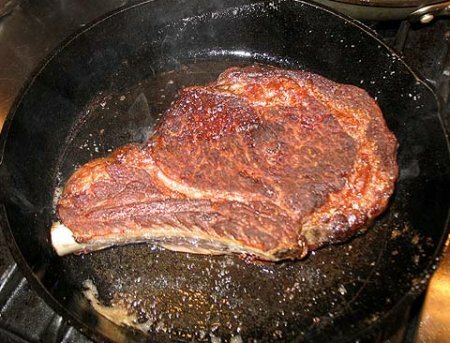 Okay, so here’s the Ducasse method of making a rib steak, as interpreted by me. This is a 45-minute process, assuming you start with a steak that has been allowed to come up to room temperature or that at least has been out of the refrigerator long enough to take the chill off it. The method starts with a skillet — in my case cast-iron but any good skillet works fine as does a pot like a rondeau — heated to a medium heat. The steak is started on its edge. The reason for this is twofold: first, it renders the fat so you’re able to cook the steak in beef fat (this echoes Ducasse’s principles of flavor reinforcement, which are nearly universal in his cooking); second, it creates an appetizing appearance on the edges.